Late tries from young winger Conor McGrath and centre Steve Tyrer snatched Halifax a crucial 18-12 Championship win over Swinton at the Shay. The Lions, a problematic proposition for Fax in recent seasons, led until the 75th minute, when a loose ball in their own 20 metre area finally gave the home side’s misfiring attack a chance even they could not spurn. Captain Scott Murrell bobbed and weaved and finally lofted the ball over the top for McGrath to score in the right corner and put Fax ahead for the first time at 14-12. And on the next set, Ben Johnston found the space to slip Tyrer over on the left, although the centre’s missed conversions left Swinton in touch at 18-12 and paved the way for a nervous last two minutes. 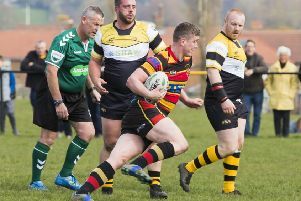 Richard Marshall’s side held on though to seal an important win ahead of next weekend’s rearranged fixture at Dewsbury. The problems began early, the first half opening with a Ben Kaye knock on gifting Swinton a free attacking set and the Lions taking immediate advantage, Andrew Thornley touching down and Chris Hankinson converting for a 6-0 lead. That actually represented the Lions’ first and last clear cut chance of the half as the home side began to shade the battle for possession and position without being able to put points on the board until Scott Murrell slipped young centre Chester Butler over just before the half hour. By that point, Tyrer, James Saltonstall and Will Sharp had all either been close to the line or over it without quite being finishing the job. And with a minute to go to the break, another chance came and went; Murrell’s short kick sitting up for Simon Grix, but the loose forward not able to ground the ball. The home side might have been reasonably content with the interval scoreline, but looked a lot less happy when a needless penalty and a try from winger Marcus Webb put the visitors 12-4 ahead with half an hour to play. Fax finally found a response when Tyrer scored his first try with 60 minutes on the clock to cut the deficit to 12-10. But with time running out and an air of panic about Fax’s work with the ball it looked like the Lions would hold on until they literally handed the home side victory in those final five minutes.